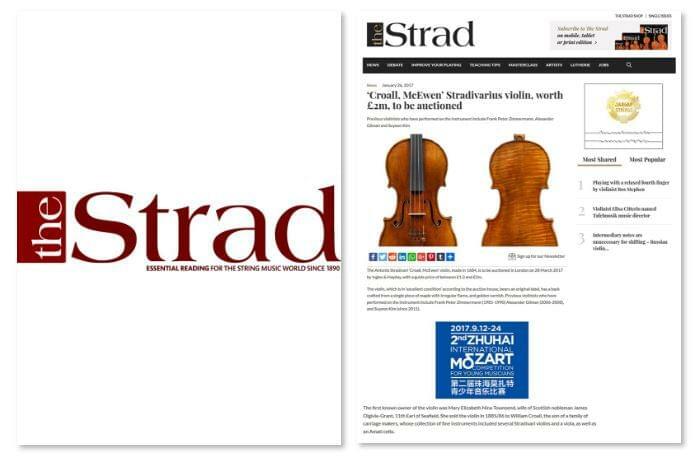 The Antonio Stradivari ‘Croall, McEwen’ violin, made in 1684, is to be auctioned in London on 28 March 2017 by Ingles & Hayday, with a guide price of between £1.3 and £2m. The violin, which is in ‘excellent condition’ according to the auction house, bears an original label, has a back crafted from a single piece of maple with irregular flame, and golden varnish. Previous violinists who have performed on the instrument include Frank Peter Zimmermann (1985-1990) Alexander Gilman (2006-2008), and Suyeon Kim (since 2011). The first known owner of the violin was Mary Elizabeth Nina Townsend, wife of Scottish nobleman James Olgivie-Grant, 11th Earl of Seafield. She sold the violin in 1885/86 to William Croall, the son of a family of carriage makers, whose collection of fine instruments included several Stradivari violins and a viola, as well as an Amati cello. When Croall died in 1906, the violin was sold to his friend and fellow collector Frederick Smith, and thereafter to violin dealers W.E. Hill & Sons, who in turn sold the instrument to another Scotsman, R.F. McEwen, in 1908 for £553. Frank Peter Zimmermann used the violin as his principal performing instrument from 1985 to 1990, on loan from the Westdeutsche Landesbank of Düsseldorf – all of his recordings for EMI Classics during this period were performed on the violin.